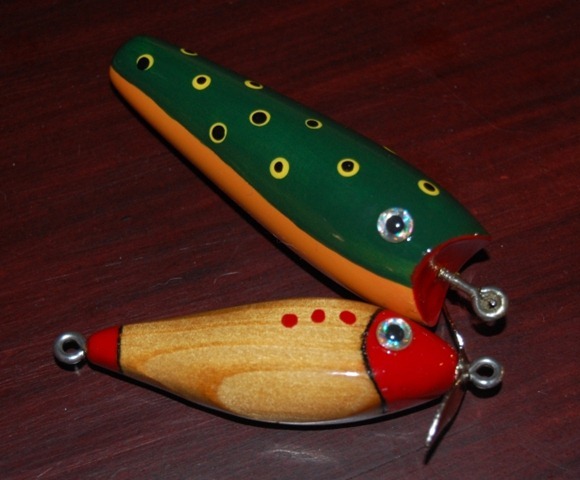 Vintage style wooden fishing lures that really catch fish! I love digging through peoples tackle boxes. I have always had that kind of curiosity. It is like digging around in your grandma’s attic. Everything you find is fascinating. Anyway, I found this old Heddon catalog and decide to buy some of those lures. I headed over to EBay and found out right quick that I don’t have the budget you need for those lures. Even if I had the budget, there is NO WAY you would throw one of those lures in a lake and let some mean old fish chew on it. Old lures are works of art! Old lures are beautiful. I wanted some lures that were cool as the ones I remembered but that I could lose in a tree without crying. These two were inspired by an amazing lure maker I found on the web Old Oregon Lures – unfortunately, the Old Oregon website appears to be gone now – those were some amazing lures. This bluegill is weighed so that it floats upright correctly and suspends about 4 inches below the surface. You can make your own wooden lures. 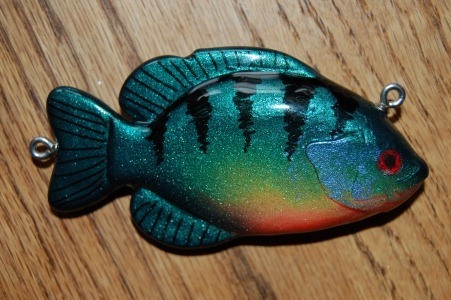 I have a post here on Make Stuff With Your Kid that shows you how to make two really great looking lures that catch fish. You don’t need a bunch of tools and you don’t need to be an experienced woodworker. All these lures have caught fish. I was surprised how well the bluegill works. In the spring, when the bass are on their beds, they hate this little bluegill and try to eat it up! 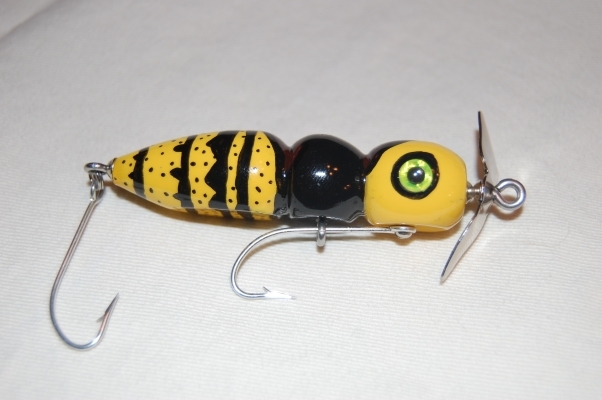 Do you have any old lures you love or you are making any lures? I would love to hear about it. 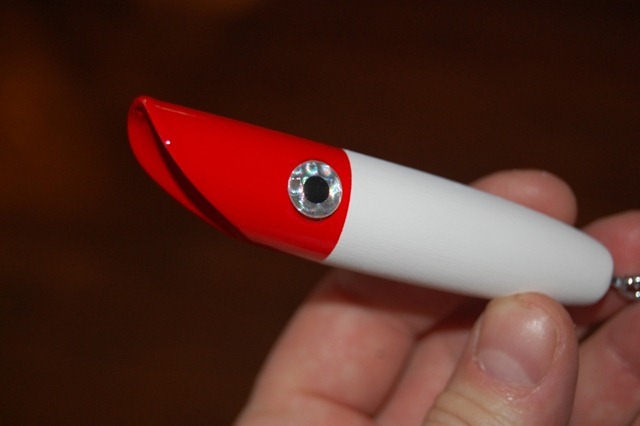 This entry was posted on April 9, 2010 at 2:38 pm and is filed under Carving, Fishing Lures, Woodworking. You can follow any responses to this entry through the RSS 2.0 feed. You can leave a response, or trackback from your own site. Those are some really sweat lures! Just one question, what kind of paint/finish do you use? I would love to try this. I use whatever paint I have – very often spray paint but when they are done, I coat them in Devcon 20 ton epoxy to clear coat them. It really makes them strong and the Devcon seems to do the best job of not yellowing quickly. If you do that, you have to spin them while they are drying so that the epoxy doesn’t drip – the funny bit, I put them in a garage sale chicken rotissery with no heat and it spins them until they are dry. If you make any, send me pics!